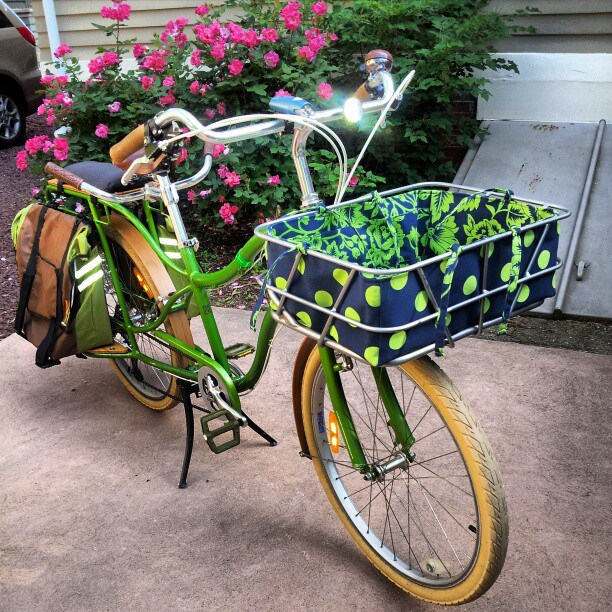 Yesterday, Bikeyface posted yet-another awesome piece, this one about how bikes simplify your life in the midst of technology and how bike commuting lends itself to real face-to-face contact with all sorts of people. I've written before about the people whom I meet while bicycling. There are one-time chance encounters and there are people we see daily whom we may have missed when driving. We certainly would have not interacted and chatted with them like we do now. This morning, I was feeling a bit down. I decided to stop at my favorite coffee place for an iced latte-- so excited to have my mounted coffee ring back on my handlebars! Just when I was unlocking my Yuba Boda Boda, this fellow rode by and suddenly stopped to ask about my bicycle. 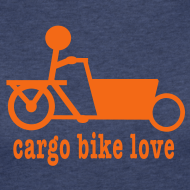 We ended up bonding over our bikes and cargo-carrying capabilities. 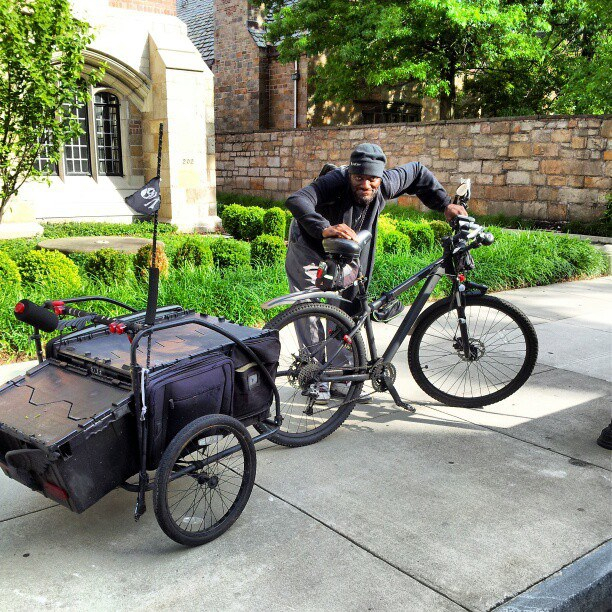 His name is Ernest and he took a kid's bike trailer and turned it into a cargo trailer using heavy-duty plastic bins. He keeps his tools in the bins and anything else he needs throughout the day. He also mounted slim bags, including a neoprene laptop case to the sides of the bins so he can stash smaller stuff more securely. He loved my Boda Boda and thought that not only could I carry a kid on the back tail but stick one up front in the big Bread Basket. He suggested that I paint my helmet apple green to match my bike. I shared that my sons would love his Jolly Roger flag. After asking permission to take his photo, we shook hands and headed off our separate ways. I pedaled through downtown feeling far lighter than when I started my commute this morning. An iced latte and a chance encounter making my legs pedal with a bit more zing and my mood lifted. My Yuba Boda Boda has a new accessory. Some weeks ago, we affixed a Bread Basket to the front, increasing our carry capacity quite a bit. While the size of the Bread Basket was great, the open slats made it impractical to carry a number of things, including my purse that would slip easily through the open spaces. I remembered seeing a great blog post on a Simple Six about the custom Bread Basket liner cargo biking mama Nicole Nafziger had made. While my limited crafting skills do not extend to sewing (unfortunately), I thought of my friend Sara who recently started a new business called Thread Blossoms and she agreed to take on the custom job. 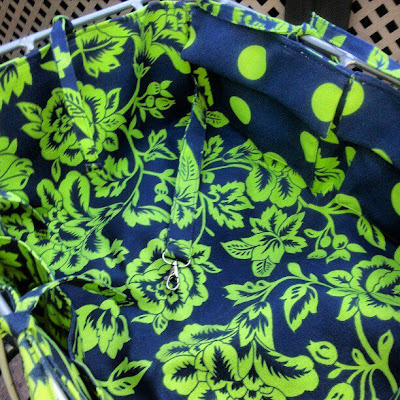 Discussing fabric choices via e-mail, we choose heavy-duty outdoor fabric that would be fun and match the gorgeous green apple color of my Boda Boda. 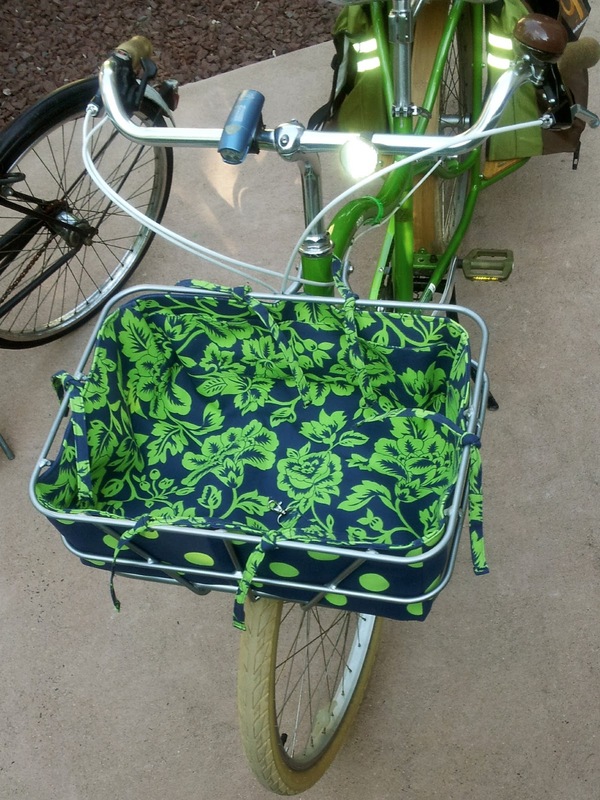 My Bread Basket liner arrived at the start of this week and I am so thrilled with it. It affixes easily with ties and contains pockets and a key fob. 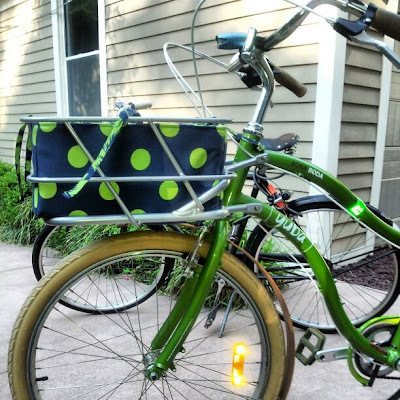 It adds yet another bit of flair to an already gorgeous bicycle while serving a super practical purpose.